Yesterday, Lotus played dress-up with tiny t-shirts that I used to wear when I was little. And today, it was my old dresses. This pink one was hand-sewn by my mom, I think. 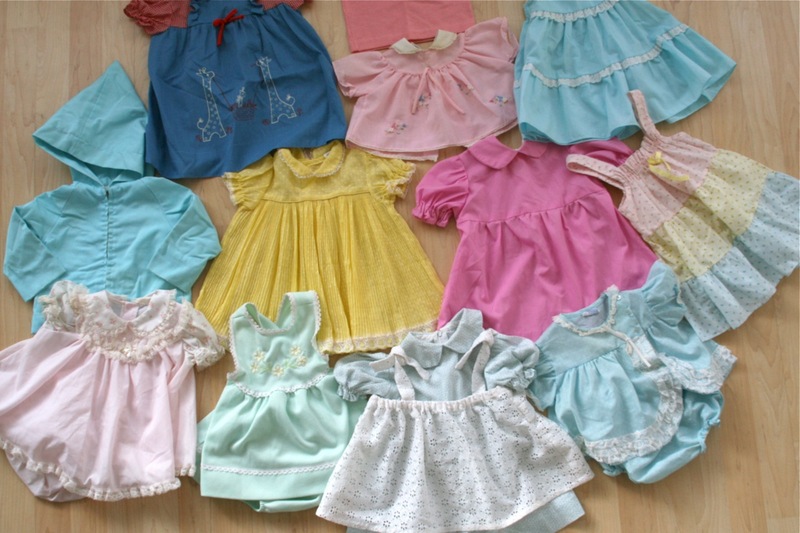 And here are the rest of my baby/little girl dresses! Some are too tiny for Lotus to wear now but they're all pretty fun to look at and everything is in great shape. Cute! I love her shoes! I love them ALL! Aren't they cute as tops, too! And..when did Lotus grow to be so tall? She's looking older than S! Did you decide on a scooter dress? I saw where the chevron one was gone when you went back. Bummer! That was was fantastic. such a little sweetheart! they are all amazing! And little lo is such a lady! haha. yeah, spill the beans on the scooter dress! which one did you end up going for- maybe should do a little post about it?? I can't believe you still have your baby clothes! Aww, so cute! And Lotus looks just like you in that last picture!